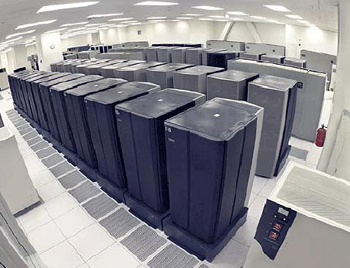 Data centers – where would we be without them? Firstly, the cost to enterprises of running an in-house own data center is increasingly prohibitive, given the growing size requirements of such facilities. As more and more information is transmitted online and more transactions take place online – just as computing power continues to grow – then a data center needs exponentially more power and more hard disk space. Server racks just keep on getting longer and even keeping them cool enough becomes uneconomically costly for most small, medium or even large-sized enterprises. Security is the second big issue – in a world where cyber-crime and espionage is constantly growing, there needs to be a very robust response to security. Most enterprises just don’t have the time and resources to police their IT operations to the level required, and a good data center can give them the reassurances they need. Technicians can be on hand throughout the 24-hour cycle, not just to ensure that the server racks keep on functioning perfectly and that any problems are swiftly dealt with, but also to ensure that information is kept safe and secure and that hacking or phishing attempts are roundly thwarted. So, where would we be without data centers? The answer is that we would have a vastly more limited cyber-world, with businesses forced to keep their computer operations artificially scaled back due to cost considerations, with the knock-on effect of a hobbled e-commerce sector. Social networks would be slow, unsafe and prone to disastrous infiltration, while search engines would also be grindingly slow and frustrating to use – welcome back to the late 1990s. It’s safe to say that data centers are not only here to stay, but will keep getting bigger and better so long as the computer world leads the way. You are right. Data centers are not going anywhere and it is very hard to even try to have your own Data center as stated. Just keeping the systems cool enough not to breakdown is a task in and of its self.